Photo above: my son Nitai at the vegie markets, La Paz, Bolivia, 2002. My reply: Thanks for your kind words. Well, I cannot say whether this is what you tasted, as recipes vary so much across the world, especially when they are cooked in large quantities. Nevertheless, here’s a delcious pumpkin recipe. This dish proves just how delicious pumpkin can be if teamed up with the correct flavour partners. 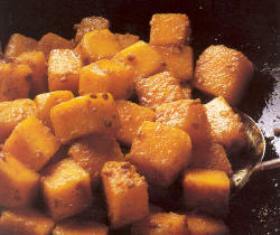 Succulent Gujarati Pumpkin is excellent served with hot chapatis. Makes enough for 6 persons. handful fresh coriander leaves, chopped. Heat a wok or deep saute pan over moderate heat. Add the oil or ghee, and when slightly hot, add the fenugreek seeds. Fry them until they turn one or two shades darker. Be careful not to darken them too much, or they will turn bitter. Add the yellow asafetida powder, saute momentarily, splash in a little water to cool the pan, then add the pumpkin, water, salt, turmeric, chili, and coriander powder. Stir, then cover, raise the heat, bring the mixture to the boil, then reduce to a simmer and cook for about 15 or 20 minutes, or until the pumpkin is tender, preferably with a little liquid left in the pan. Add the sweetener and lemon juice, fold through, then remove the pan from the heat, sprinkle with fresh coriander leaves and serve hot.